1Lightly salt the meat strips. Dust them with flour. 2Heat 2 tablespoons oil in a large heavy bottomed skillet over high heat. Sauté the meat in portions until it is browned on all sides. Lower the heat to medium and add the minced onions and cook until they are soft, about 4- 5 minutes. Pour in the white wine and cook, occasionally stirring until the wine evaporates all, about 7 min minutes. Add the beef stock; mix well and simmer, partially covered, over a low heat for 1 hour. 3In a large skillet over medium heat, sauté the sliced onions with 3 tablespoons olive oil and garlic. 4Once mushrooms are cooked transfer them to the meat and gently stir in the sour cream, mustard and parsley. 5Meanwhile, cook the potatoes in a large pot of boiling, salted water until tender. 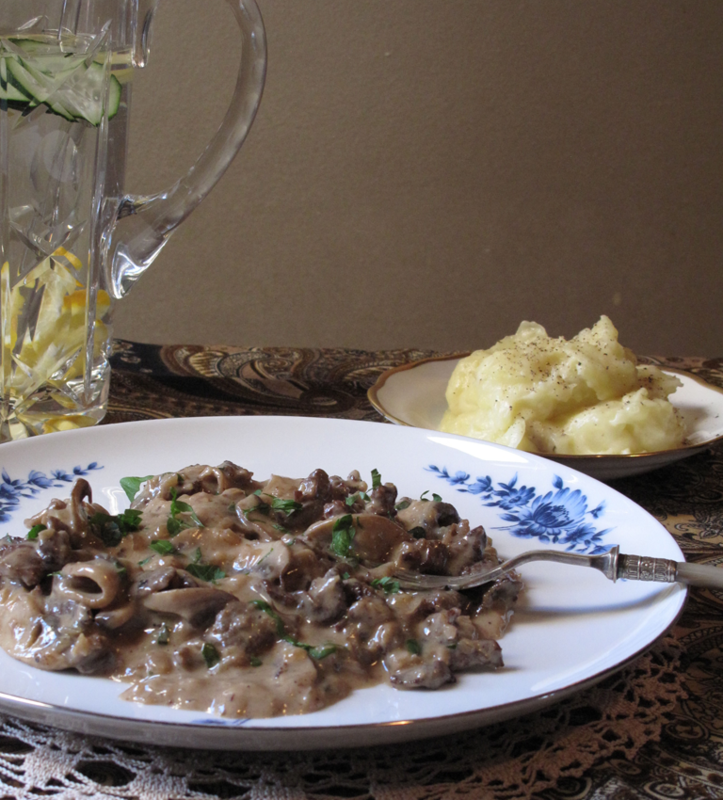 6Serve the stroganoff over the mushed potatoes; garnish with chopped parsley.